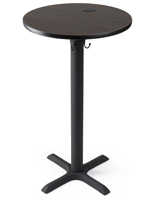 Our wireless charging tables are great for accommodating patrons in the modern age of smart phones. 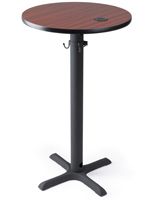 Restaurants, bars, hotels, and other lounge areas are ideal applications for featuring these fixtures because they encourage customers to stay longer to power their device. 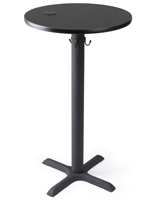 Wireless charging tables have a convenient design, patrons only need to set their smartphone on the circular pad to refill their battery. Each unit is made to support both popular standards for inductive charging, Qi and PMA. 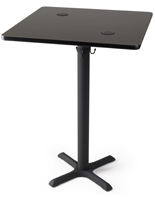 This means that the wireless charging tables will work with any device with the technology. What options are available with this furniture featuring cordless power transfer stations? 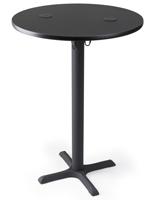 These wireless charging tables are offered in both square and circular designs to fit any establishment. Choose from these two shapes to fit the fixtures in your bar or restaurant. 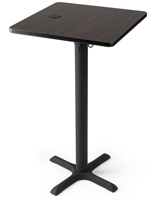 The charging tables are also available in different sizes. Our larger models have enough space to fit two phone power stations while smaller models only feature one. Our selection of countertops includes a few different finishes. 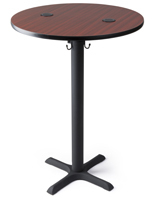 Accommodate an establishment's interior with a black, mahogany, or mocha walnut tabletop. This selection of charging tables has some extra features that make them a convenient choice for lounge areas. Underneath the tabletop, there are small hooks for bags and umbrellas. Customers can put their handbags out of the way while they dine and power their device. Why not give patrons extra room for their accessories? 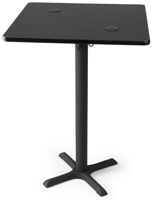 Another feature that these tabletops benefit from is their cable management system. Each fixture strings the cords through the center support to keep them out of the way. The countertop is also spill resistant, preventing damage to the power stations if any drinks are toppled. How do you know phones will work with these charging tables? These countertops are made for maximum compatibility, supporting the two most popular standards used in major devices and accessories. Find out which phones include inductive charging out of the box in our comprehensive article on the technology. Recently, the iPhone 8, 8 Plus, and X released with Qi compatibility, bringing attention back to the subject. With Samsung's flagship Galaxy series also including support, inductive power transfer is and will be in the hands of many smart phone users. Why use furniture with inductive charging over classic cords? As the mobile device industry progresses, more and more models are likely to use the technology. This is great for compatibility, as Apple and Android devices use different cords and even different ports to supply power. These tables support all currently used standards and require no extra hardware so there's no worry of a power cord being stolen. Let your customer put their smartphones down and relax while their battery refills!